FESTIVAL REPUBLIC’S MELVIN Benn has floated the idea of increasing the capacity of Electric Picnic to 45-47,000 this year. 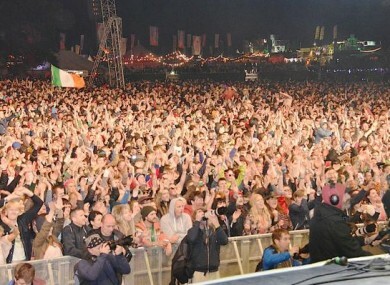 Last year the event at Stradbally saw the Stradbally event take in 42,000 revellers. At today’s Electric Picnic launch in Dublin Benn told DailyEdge.ie that this year they are looking at increasing that by up to 5,000, but emphasised that this is just a ‘maybe’. Benn also said that there is one more headliner to be announced, which will come in due time. Florence and the Machine, Underworld, Hot Chip, Róisín Murphy and Manic Street Preachers have already been announced on the line-up. Email “Electric Picnic could increase capacity to 47,000 this year ”. Feedback on “Electric Picnic could increase capacity to 47,000 this year ”.